After using Multiple Registration Forms to register different user roles with different fields, it makes sense to set up multiple edit profile forms and offer all these user types an option to access and edit their (different) profile information. Using the Multiple Edit Profile module you can set up one or more front-end edit profile forms with different fields. After activating the module from the Modules UI, the Edit-profile Forms tab will show up in the Profile Builder menu. Here you can edit all the existing Edit Profile forms as well as add a new form. If you haven’t created any Edit Profile form yet, you will be taken directly to the Add New Edit Profile page. For adding a new registration form, simply click the “Add New” button and enter a form Title. You can also choose if you want to Redirect users after they edit their profile to a specific URL. When setting up a new edit profile form you can choose which fields to appear in it. You can easily add, edit or delete any of the fields defined in the Manage Fields tab. You can also drag & drop to reorder the fields to your liking. You can have for example a lite registration, where users fill in only some basic fields, followed by a detailed edit profile where they are required to fill in more information. Also using the two modules you can have some fields only show up on registration and not on the edit profile, making them not visible and editable by the user afterwards. This setup offers major flexibility for managing your user fields. 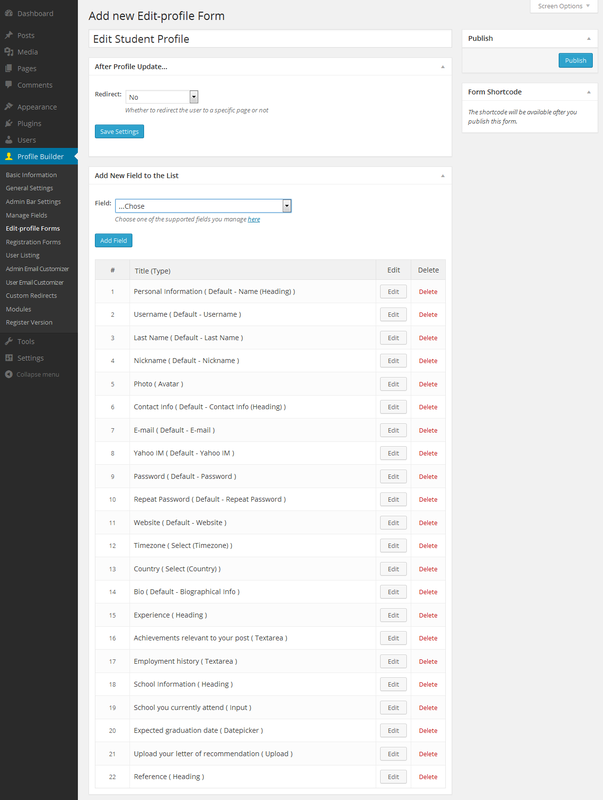 After setting up the edit profile form options and fields you can go ahead and “Publish” it. 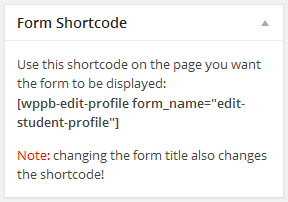 After publishing, you will be prompted with a form shortcode that can be used to display the form in the front-end.